We’d love your help. Let us know what’s wrong with this preview of Retrato de uma Doadora by Lissa Price. Uma história complementar que vai ajudar você a entender mais o mundo de Starters. A Prime Destinations é uma empresa que aluga os corpos dos Starters para Enders que querem aproveitar a vida em um corpo mais jovem e com muitas habilidades. A promessa feita ao Starter de que ele jamais se lembraria do que o seu inquilino fez não é verdade. O Sta Uma história complementar que vai ajudar você a entender mais o mundo de Starters. A promessa feita ao Starter de que ele jamais se lembraria do que o seu inquilino fez não é verdade. O Starter que alugou seu corpo (o doador) se lembra de quase tudo. Nesse conto; a história é narrada pelos viés de alguns Starters doadores e fala os riscos que eles correram (e continuam correndo) enquanto seus corpos estavam sendo usados pelos Enders. To ask other readers questions about Retrato de uma Doadora, please sign up. 2.5 stars for a boring shortstory that was beautifully written. Portrait of a Donor by Lissa Price is a novella in the Starters series. It is told from the perspective of Briona, who is a donor. This novella is a great addition to the series. Can't say I liked its plot and also it added nothing to the main story. Anyway, I’ve went through hell and back just to find an epub copy of this novella AND I MEAN HELL. I spent a long time searching! And so, nothing new to the main plot. Just a novella. I finally finished this series and I’m done with it and I’m just... finally. Creepy time after the Spore Wars. The Starters have it rough. Uma aventura curta na visão de uma das doadoras da Prime Destinations. Outro conto curto que se passa no mundo da série Starters e Enders. Dessa vez, Lissa Price nos coloca no corpo de uma Starter que foi doadora da Prime Destinations. 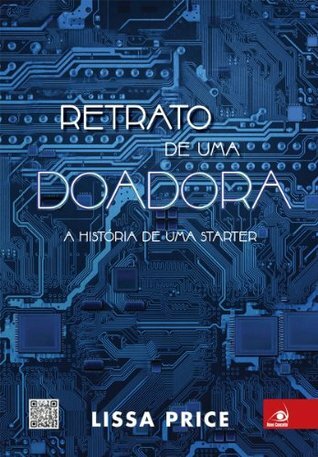 Embora a trama do livro não esteja diretamente conectada ao primeiro livro, ela se passa depois dos acontecimentos da primeira história e eu não recomendaria a leitura desse conto para quem ainda não conferiu Starters. Entretanto, não é preciso ler esse conto par Uma aventura curta na visão de uma das doadoras da Prime Destinations. Entretanto, não é preciso ler esse conto para ler Enders. A história é bem curta, mas bastante interessante, ainda mais por de tratar de Starters que aparecem no primeiro livro (mas cuja história não é contada). Não vou revelar detalhes, pois o conto é realmente curto e qualquer coisa já seria, de certa forma, um spoiler... mas a aventura é bacana e a leitura prazerosa. O que mais me agradou foi o final, que realmente conseguiu me surpreender! Estava esperando apenas uma história bobinha e previsível, até que o final me trouxe algo que eu não estava esperando. Outro conto de Lissa Price trazido pela Novo Conceito que vale a pena ler! O ebook pode ser baixado gratuitamente neste link. P.S. : Uma coisa estranha sobre esse ebook: não há uma página com as informações do livro, como data de lançamento, tradutor ou mesmo ISBN. -Perspective: The great thing about 1st person is that you do get a strong connection to the main character, despite what 1st person haters say. However, you sacrifice some intimacy with the fringes of the cast sometimes as a result of POV hazard. On top of other related plot elements, these stories are great at connecting with other characters. They're truly fascinating! I hope we see more, because it was a pleasure reading through Briona. -Connectivity-seeing items link together between Starters and Enders through these stories is definitely a pleasure. I wish I read this before I read Enders! -None, this was my favorite Portrait installment actually! A short story from the point of view of one of the donors from Starters, Briona. An Afrian-American girl, she repeatedly mentions being discriminated against for her skin tone. It covers her exit-interview at Prime Destinations and the day or so after. This story was slightly better, but not by much. Briona is a character we (and Callie) only see being occupied by someone else in the novel proper. This gives a little peek into her personality and some insight as to what happens to most of the do A short story from the point of view of one of the donors from Starters, Briona. An Afrian-American girl, she repeatedly mentions being discriminated against for her skin tone. It covers her exit-interview at Prime Destinations and the day or so after. This was a really good short story. Very well developed, picking up facts from the series, and even being small the author managed not making crazy jumps on the plot. The characters well developed, the pace really good, the writing also great. Although the end had something predictable at the same time there was another twist that changed the predictable part. I really liked the connection made between these characters and the ones on the series. Great short. This review has been hidden because it contains spoilers. To view it, click here. After the fall of Prime, donor Briona is interviewed by the authorities and then tries to figure out what to do without the lucrative payday she was promised. This was a super short little story showing us what happened to Briona, who we only saw being "possessed" by another in "Starters." To me, it feels like one of those "Choose Your Own Adventure" books where the story ends abruptly with doom. Since it been quite a time since I last read Starters, this story was very very confusing. Even know when I read the ending I still can't think who they all were. Fantastic and the best of the short stories. But, it was also the shortest one as well. For those that think a super short story is not worth $2 (kindle version) I say most pay more than that for a drink when they eat out so I think it's well worth the money if enjoyable and this one was. I loved the ending. This one was interesting because it was about a character we had already met, well sort of, in Starters. It definitely makes me want to dive into Enders to see if we find her again or if that is the end of her story. It was good but not really relevant to the story. If read before Enders, it would really build some suspense for it. I'm getting prepared to read Enders and that sneak pick at the end was awesome. Can't wait to continue this series. Great quick read! This review has been hidden because it contains spoilers. To view it, click here. Again, not at all the story I was expecting from this. Much darker. I hope we get a glimpse back and some vindication in Enders. Another interesting short story! On to Enders! Can't wait! I think Portrait of an Ender was better, but this was interesting as well. Great ending and what a surprise. Love this series and excellent especially for a novella. Yet another fun and exciting novella. This one, I'd say, is the the most important to the story. I enjoyed it a lot and highly recommend it.